If you’re looking for the perfect backdrop for your diamond, look no further than one of the world’s rarest metals–platinum. The ultimate statement in jewellery, platinum is a precious metal with a beautiful cool white sheen. Platinum is a rare precious metal, typically comprised of 95% platinum and 5% other metals, also known as alloys. Labeled as 950 platinum, it is a dense, malleable silver-white metal that makes it ideal for crafting jewellery. Why should I choose a platinum engagement or wedding ring? Synonymous with opulence and luxury, this exclusive material is mined at a rate of 1/10 that of gold, making it a special choice for engagement and wedding rings alike. Its rarity means that platinum carries a premium price point. However it’s also one of the most economical metal choices as its glorious shine is easy to retain with simple polishing. Buffing platinum with a soft cloth doesn’t remove any layers, unlike gold. In fact, some say platinum gets better with age, thanks to its satin sheen that develops over time from daily wear and tiny scratches. This sheen is also known as a patina. Platinum’s low reflection point doesn’t reflect colour either, which means your centre stone’s brilliance takes centre stage. And lastly, platinum’s purity makes it naturally nickel-free and hypoallergenic, ideal for those with sensitive skin as platinum rings can be worn every day with comfort and ease. 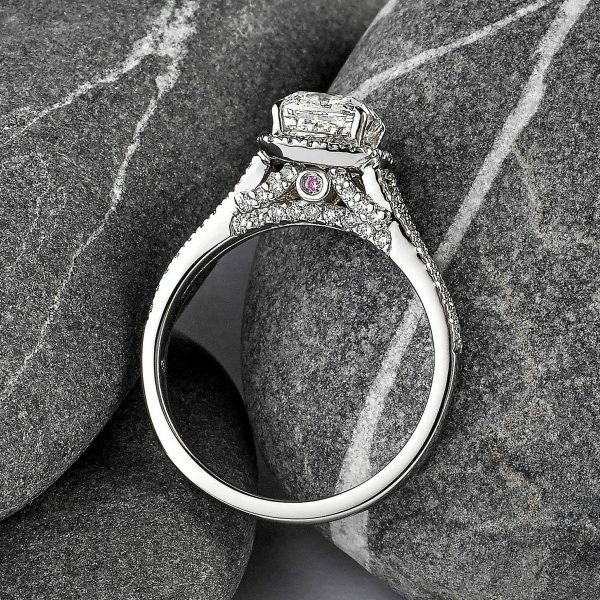 What is the most popular metal for engagement rings? Due to its low level of maintenance and its lustrous bright, white finish, platinum continues to be the most popular metal choice amongst our customers. 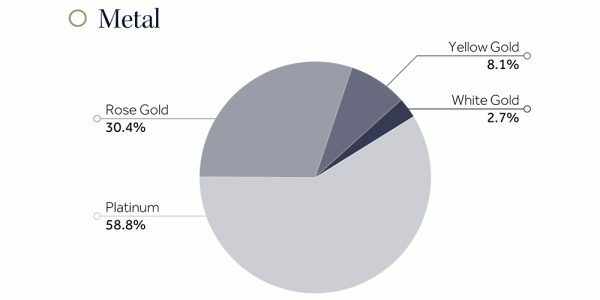 58.8% of our engagement rings are crafted in platinum. Platinum is an iconic choice when it comes to jewellery. Its naturally bright, white appearance will retain its beauty to ensure your ring will be treasured for a lifetime. One of the most frequent questions we hear is ‘should I choose platinum or white gold?’ Both metals have their pros and cons–your choice should be entirely based on personal preference. Gold in its natural state is yellow. In order for white gold to appear white in colour, gold must be mixed (also known as alloyed) with a white metal(s) like nickel, palladium or silver which makes white gold a light grey colour. To give white gold its sought after sheen, it is then rhodium plated. With time, rhodium plating will wear away revealing a yellow-ish tinge, and the ring will need replating every 12-18 months to maintain its lustre and radiance. So while white gold is initially more affordable, there is a maintenance cost involved every 18 months or so. 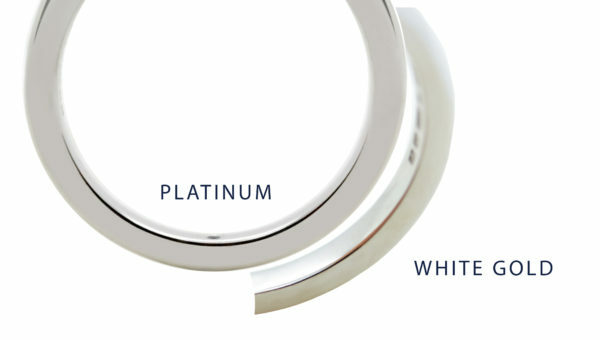 While offering a similar finished appearance to white gold, platinum won’t require this same level of maintenance due to its natural bright white appearance. In fact, platinum’s shine is easy to retain with a simple polish. This exclusive material is mined at a rate of 1/10 that of gold, hence its premium price point. Lastly, platinum is nickel-free and hypoallergenic which is ideal for brides and grooms with sensitive skin as it can be worn comfortably every day. Both metals make excellent choices – it’s totally down to personal preference having taken the level of maintenance into consideration.